Today, we have a really incredible interview from Emily Brown who will be sharing her experience as a mama of multiples. Emily is mama to Liv & Nealy + one on the way! 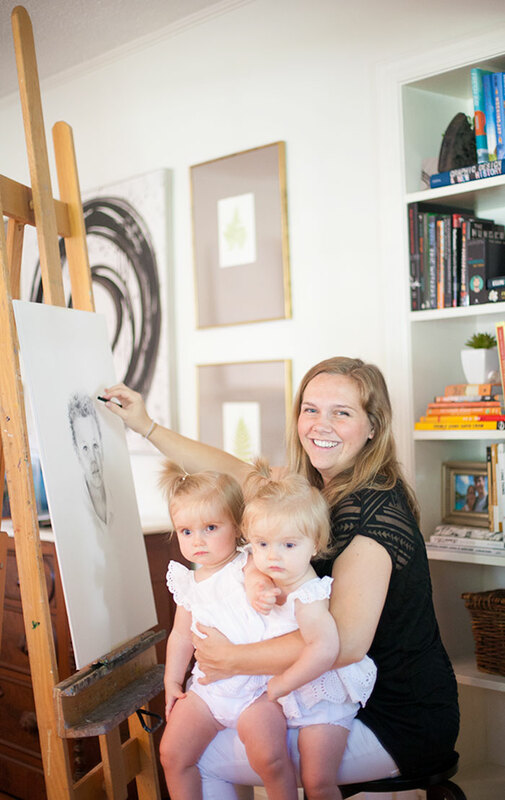 She is a stay at home mom and runs her own business as a charcoal portrait artist. I am really excited to have Emily here today to share her story. I really loved getting some perspective from Emily who There are many soon to be mama’s of multiples out there who are always looking for stories and insight about life with twins. My pregnancy was relatively uneventful until my water broke at 32 weeks and 6 days. My husband Jeremy rushed home from work with his emergency lights on (so funny to me!) and we headed to the hospital. I was all checked in and settled around 5:00pm and they gave me a shot to help develop the girls lungs. They were planning to keep me on hospital bed rest until I reached 36 weeks, but the girls had other plans! My labor started to progress and because they were early, baby B was transverse, and they shared a placenta, I was rolled into the OR for a c section. At 12:13am Jeremy and I got to meet our baby girls for the first time! After our 11 day stay in the NICU, we brought home two tiny baby girls. Life with preemie twins was tough to say the least. We were thankful the NICU had gotten them on the same schedule, but they were still eating every 3 hours around the clock and took 30-45 mins to drink less than an ounce. Combine that with pumping for 30 minutes in between feedings and I basically didn’t get off the couch for the first few months. There are awesome twin feeding pillows and bottle props out there, but with the amount of burping I was having to do and spit up I was dealing with from their premature digestive systems, it was just easier on my sanity to feed them one after the other rather than juggle everything at once and get frustrated and messy. Six months was a major turning point for us. They turned into great eaters and great sleepers and I was finally getting comfortable leaving the house with them – even if only for an hour. It’s amazing what seeing other adult human beings at the grocery store during the day did for my sanity! My mom and I also set up one day a week where she would keep the girls while I worked – which was, and still is, tremendously helpful! 1. What was your reaction when you found out you were having twins? We were shocked! We never even thought of twins as being a possibility! We found out at my first ultrasound at 8 weeks. Jeremy says he saw the ultrasound technician get a funny look on her face and then after she made a few more measurements, she said, “Ok, so here’s the baby and over here is the other baby!” I thought she was showing me the back of the baby! Nope – TWO babies! We couldn’t stop laughing and were so excited to tell our family and friends! 2. What advice were you given when you were pregnant with your twins? What advice was actually helpful? I surprisingly didn’t get very much unsolicited advice! I didn’t know many moms of twins at the time, but the advice they all gave me was to take it one day at a time and to not stress over housework. If you saw the amount of laundry I need to do right now you’d know I still use this advice! 3. What baby products and items were must haves when you were caring for newborn twins? We kept it very, very simple! Our top must haves were swings, swaddles, Mam preemie pacifiers, and dozens of burp cloths. For doctors visits and errands, my Baby Trend double Snap N’ Go was a lifesaver and for walks around the neighborhood, my mother in law gave us the Bumbleride Indie Twin which we still love! 4. Do you have any help or have you hired any help? When we were totally losing our minds with no sleep, we decided to hire a night nurse one night a week. She only came once and then the girls coincidentally started sleeping through the night! She was worth her weight in gold & we should have hired her a lot sooner! We are also so fortunate that both of our families live in town and are excellent babysitters! When we first brought them home, we had them swaddled and in the same bed, only because it was easier to hold both pacis in. Now they sleep in the same room but in separate cribs at night and for naps and have always slept at the same time. It was a really hard and tiring job keeping them on the same schedule in the beginning, but I’m so glad we did because I think it is why they are so predictable now at 16 months. They are such great sleepers now! They sleep 12-13 hours at night and take a 3-4 hour nap in the afternoon which is wonderful and literally an answered prayer. 6. You have another baby on the way, Congratulations! How have you prepped mentally and emotionally for the new baby? Thank you!! Three in 17 months is going to be crazy! And to be honest, I really haven’t prepared myself for it! I spent a lot of time while I was pregnant with the girls thinking and worrying about logistics and how everything was going to work out. It turns out, absolutely nothing is how I imagined it so all of that time was spent on nothing. My biggest worry is how I will give all three the attention they need, especially now that the girls are really starting to test boundaries. But when I begin to worry, I remind myself that my God doesn’t make mistakes & that His timing is always perfect. The surprise of twins has been an enormous blessing, so I can’t wait to see what He plans with this surprise! 7. Do you have difficulty telling your girls apart? Any funny ways you remember which is which? Actually, I sometimes do! I would never mix them up forever, but at first glance, especially when I can’t see their whole face, it is hard to tell! And they look the exact same from behind – Nealy’s hair is a tad bit blonder and Liv’s hair is a little thicker, but you have to see them side by side to tell. Most people tell them apart by remembering that Nealy has an hemangioma on her chest and Liv (usually) wears glasses for an eye condition (PHPV) she was born with. I can’t believe I’m admitting to this, but there are pictures of them as infants that I have no idea who is who! Time to start writing on the backs of my photos! I never get offended when a friend asks who is who – I totally understand! I know it sometimes feels awkward for the one asking, but I really appreciate them wanting to treat them as individuals and don’t mind at all! 8. What are some of the best questions or comments you have gotten while out in public? We have gotten some really crazy questions! Most people want to know if twins run in my family or ask me what their names are. This is usually followed by them telling me about their cousin’s neighbor’s sister’s friend who has twins or telling me what they would name their twins if they had them. Someone once asked me which twin was my favorite! The craziest question I’ve gotten was if I was sure they were twins! Ha! Yes, I’m pretty positive & I have no idea what she meant by that. Aside from the rare negative remark of “better you than me” most people are extremely nice and we love being stopped to chat. The girls love to wave and blow kisses when they make new friends! 9. Hardest part about being a Mama of multiples? The hardest part for me is feeling like I’m always choosing between them. Seemingly little things, like who to get out of their crib first in the morning, who to pick up when they’re both at my feet reaching up for me, even getting in and out of the car takes a conscious choice I wish I didn’t have to constantly make. The positive side to this is that they’ve learned to be somewhat patient and are growing up sharing their world with another person. It’s a hard lesson to learn that you aren’t the center of the universe and maybe being a twin will make them especially sensitive to the needs and feelings of others. 10. Best part about being a Mama of multiples? It is so much fun watching them play and learn together. The twin bond is an amazing thing to witness and the hugs and kisses they give each other just melt me. I love that they will always have each other and have never known the world without their sister in it. I also love how hands on Jeremy has gotten to be with them. From the very beginning, it just wasn’t possible for me to be the primary one caring for them, so we have each shared the load equally – he feeds one while I feed one, he dresses one while I dress one, etc. While most dads sleep through middle of the night feedings, Jeremy was up right next to me feeding and changing diapers. Their relationship with Jeremy is so fun to see – they are total Daddy’s girls and I love it. Lastly, any tips you want to give any pregnant or new Mama’s of multiples? The best advice I have is to take it day by day and if someone offers to help – let them! There have been many days that I have been totally exhausted, frustrated and just running on fumes and I had to learn that that’s ok. The good days far outweigh the bad and no one is perfect! Learn to be patient with yourself and remember God has specifically chosen you to care for them and His grace is always enough! Trust me, if I made it through those early months, you can too! Enjoy your double blessings – twins are SO much fun! 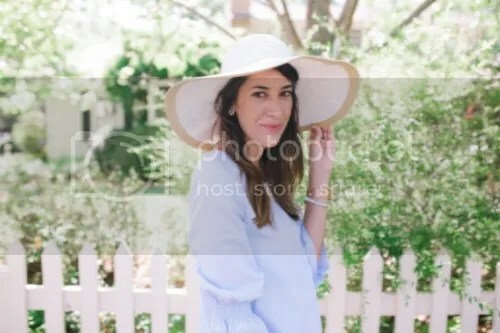 *Emily has done many portraits for people in her community and also for other’s from around the country such as; Erika Powell of Urban Grace Interiors. Please visit her website or Instagram to view her beautiful work.